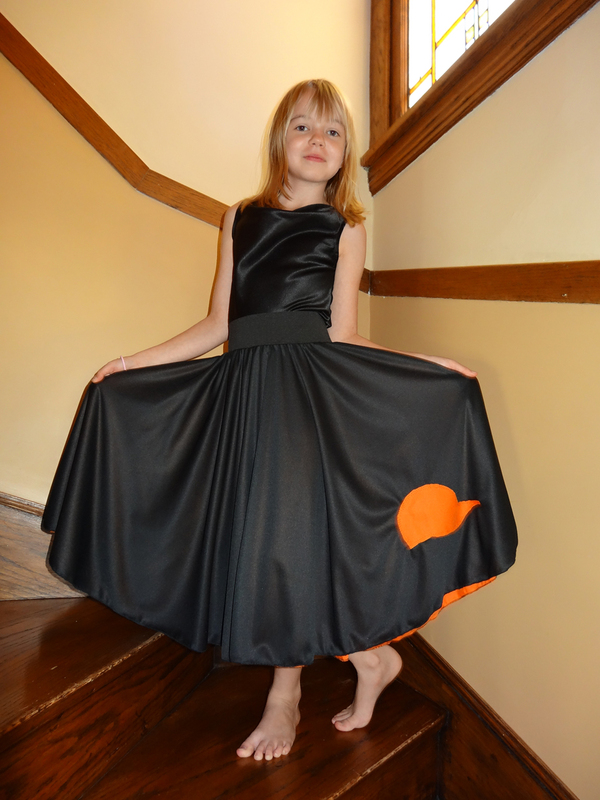 Here we see my sister modeling a skirt I made for my friend Genny’s birthday. It’s a reversible knit skirt with an elastic waistband. It’s based off of the character Dirk Strider from the webcomic Homestuck. I put an applique of Dirk’s glasses on the orange side and and one of his hat on the black side. Genny is planning to cosplay as Dirk later on in the year, and hopefully she’ll allow me to post a picture of her complete costume on my site! The applique on this skirt was difficult to attach because the threads wouldn’t catch during the stitching, and I’d take the skirt off the machine to find terrible seams. The issue might have been that I was trying to applique a knit to another knit. However, I was able to fix the applique in time for my friend’s birthday, and I am very pleased with the result!